On Monday we had our arrival charette. 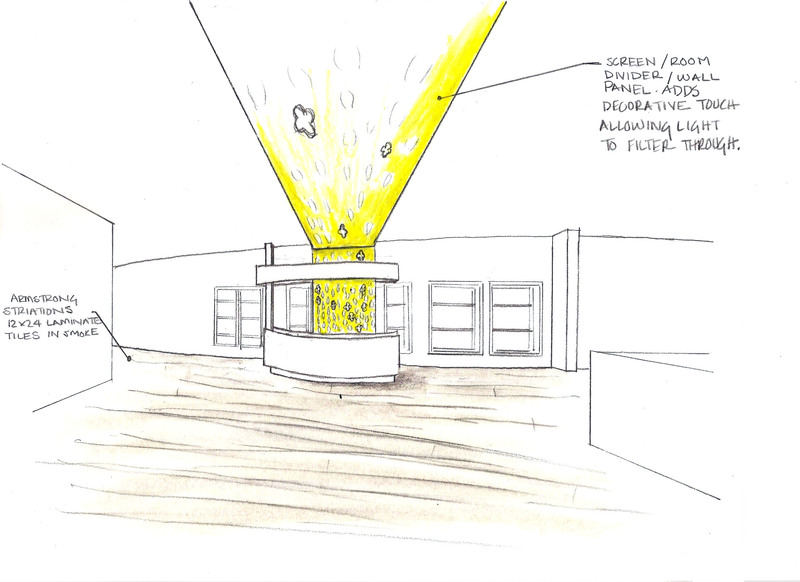 We picked the most significant arrival space in our building and sketched out 3 different ideas for that space. Other arrival spaces would then be designed using similar ideas. We were given 30 minutes to sketch each idea and 15 minutes to pick out finishes, colors, etc. The arrival space/ reception desk is located to the right of the elevator exit. It is an open space with over 8 foot corridors. The windows allow a lot of natural light to enter the space. The circular element above the desk was inspired by the Pinterest Image. The slats would allow daylight to flow through and into the space. The screen behind the desk was intended to create privacy behind the desk but allow light to penetrate through. The light coming through the screen and casting patterns on the surroundings inspired me to maximize on the use of the windows in my facility. I felt that instead of shying away from the windows, it would be a challenge to incorporate them and use their light in the design to maximize one’s experience in the space. Bringing the screen up to the ceiling and having it appear to be floating adds interest to the space and draws the user forward after exiting the elevators. *The colors in this sketch are not accurate, but are what I had on hand at the time. 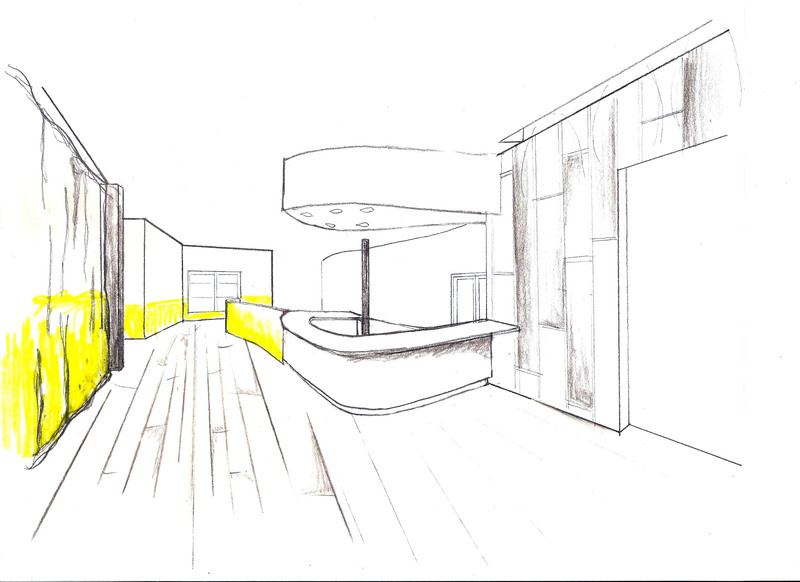 The design of the reception desk is curvilinear which flows into the partition wall that on the opposite sides provides banquet seating. The two-tone curtains are inspired by the Pinterest image that has the walls painted two separate colors and has drapes that match those two separate colors. Therefore, when the drapes are closed, the flow of the space communicated by the horizontal lines is not interrupted by solid color drapery. The lighting over the elevators creates interest on the wall and draws people’s attention as they leave the space. 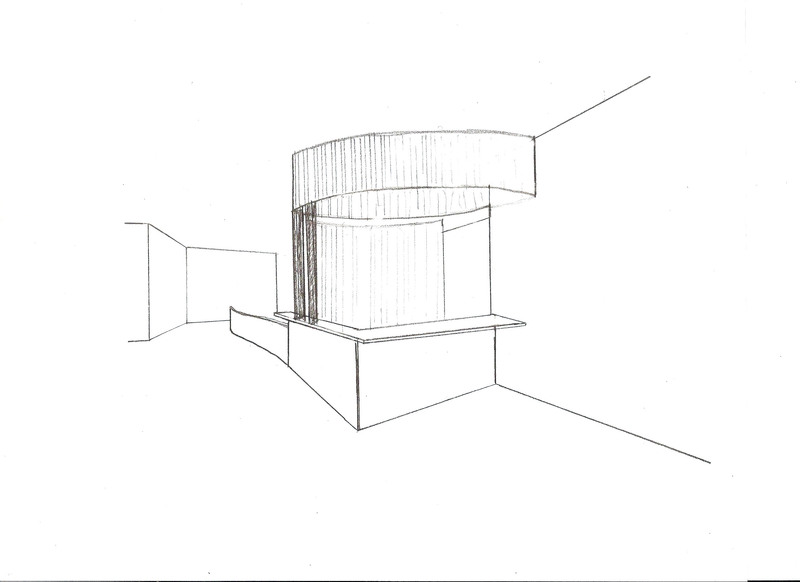 The curvilinear desk attached to the partition wall just to the right of the elevator exit was the professor favorite. It seems to work the best with the curves in the space and communicates the concept of movement well.